Jihad Watch : The lesson is clear: some Muslims consider any expression of the Christian faith (as well as any expression of other non-Muslim religions) as provoking to Muslims. So all the good Christians who castigated us for holding our free speech event in Garland should be consistent. If their intention is to avoid provoking Muslims at all costs, they should close down their churches now and convert to Islam. It would be the tolerant thing to do. 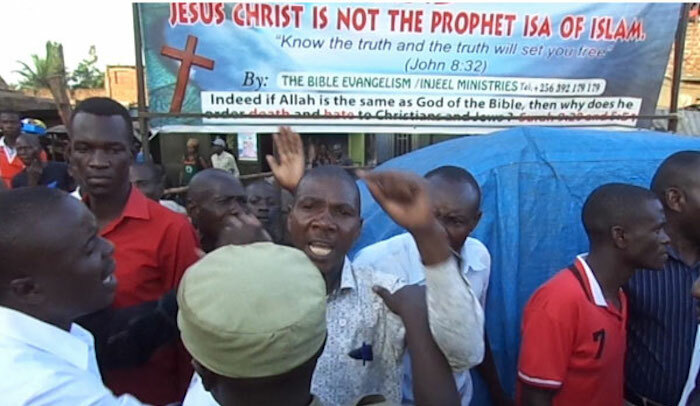 IGANGA- A group on Muslims have attacked Christians [sic] preachers, accusing them of “despising Islamic teachings at their crusade”. The crusade that was presided over by Pastor Moses Saku, was organised by the Bible Evangelism Ministry, at Kigobero Grounds in Iganga Town. It degenerated into chaos when a group of Muslims said the Born Again preachers were using the platform to ‘demoralise Islam’. Pastor Saku, the Muslims alleged, told his congregation that ‘Christianity was far better than Islam’, to the irritation of some Muslims who were in attendance. This prompted Police from Iganga Central Police Station to intervene. Mr Ayub Waiswa, one of the Muslims, said they had from the onset of the crusade, warned the Christian preachers against making provocative statements. Mr Swaibu Malinzi, another Muslim, said since the preachers had ‘waged a war on Muslims’, they had also been forced to declare a Jihad against them. The preachers, however, dismissed the allegations as untrue and accused their Muslim counterparts of gagging them from telling people the ‘truth’. “We have never abused Muslims or Allah but it seems they [Muslims] are concerned by the way we were highlighting the contradictions in the Koran,” Pastor Saku said.